Birds keep Juli entertained during winter months. They're a spirited sign of life in a very quiet and often grey landscape. Winter weather limits the color palette to grey, white, brown and a bit of green, so why not attract some colorful birds to your garden by using feeders? Host a winter bird-feeding party. It's fun to hear birds calling out to each other when you're filling the feeders. Are they spreading the word that the party's on? How many kinds of birds can you spot? Just like humans, different birds like different foods. It’s not possible to serve each individual what they like, so what should you feed most of your feathered guests? Many birds will come to your party if you serve some or all of these. 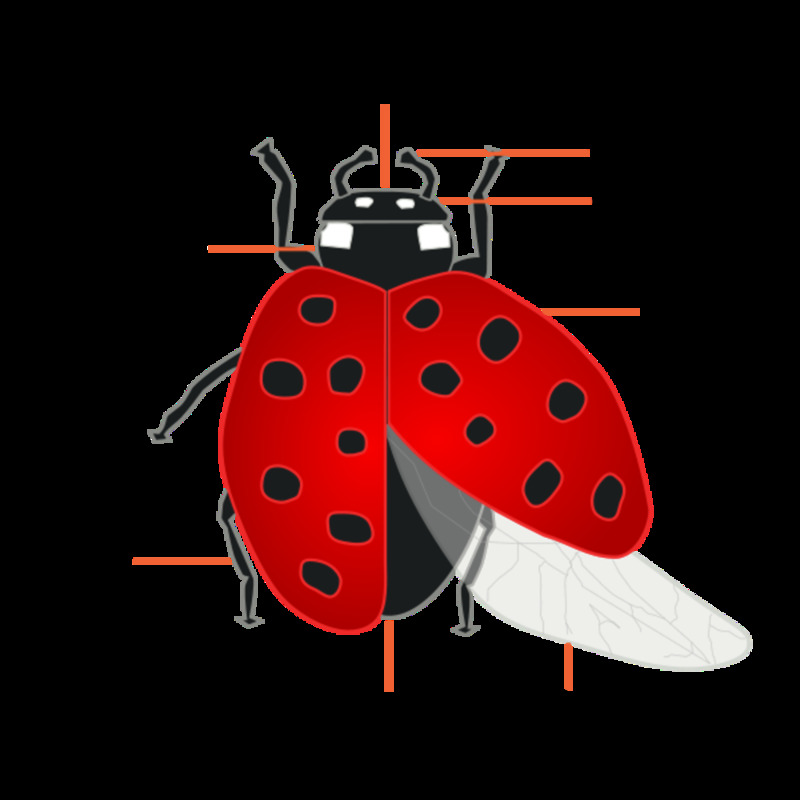 There are three main types of feeders to fill with seeds. Hopper: it looks like a house with a perch on either side of it. Tray: which is fastened to the top of a sturdy post. Tube: it has small posts next to holes on different sides. Each post has room for only one bird to perch. Guests can also eat off the “floor.” Some birds prefer to eat the seed that falls from feeders onto the ground. Some are too big to perch on hoppers or tubes. Three feeders (left to right): hopper, tube and suet holder. Place feeders in the open with bushes a short flight away for safety. Keeping feeders in the open allows birds to see predators. Evergreen bushes like arborvitae or spruce provide a hiding spot for the birds in case of predator attack. You also want to place them where you can see them from a window in your house. How often you fill the feeders depends on how many come to eat. You’ll need to observe how fast the feeders empty. Generally every day or two. It's not unusual for a small flock of one species of bird to be at your feeders. Lots of guests can put the food away! 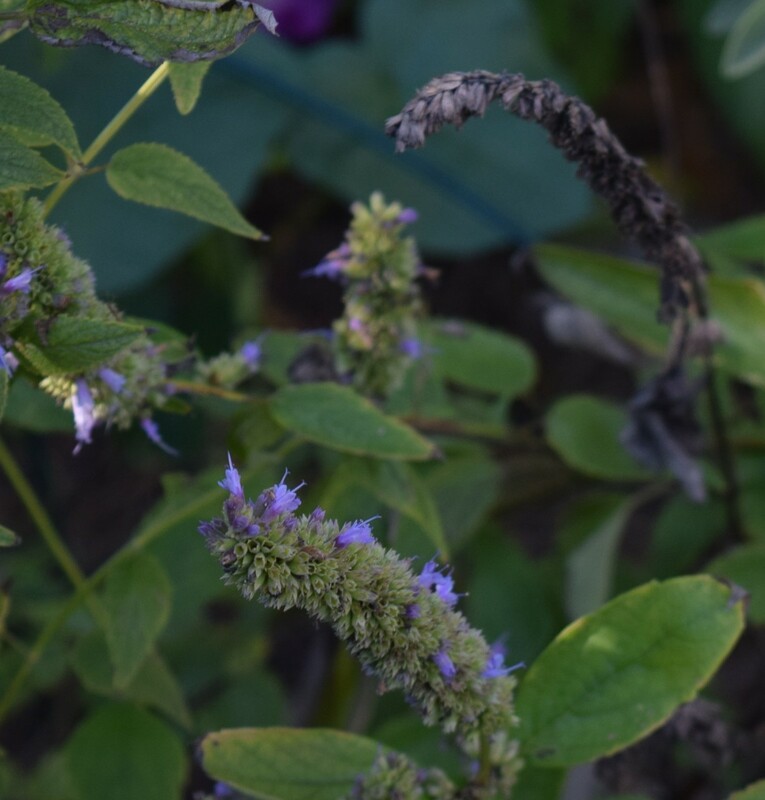 Agastache or Hummingbird Mint goes to seed. 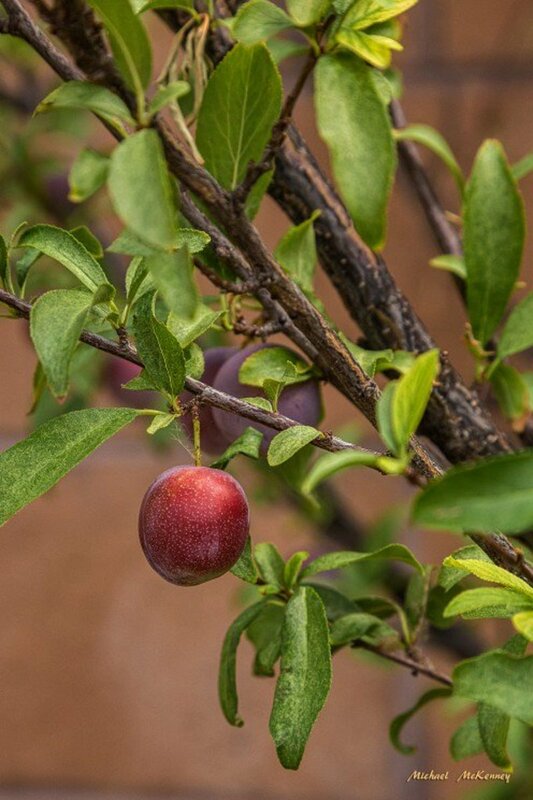 Your garden has many dried and living arrangements that double as bird food. 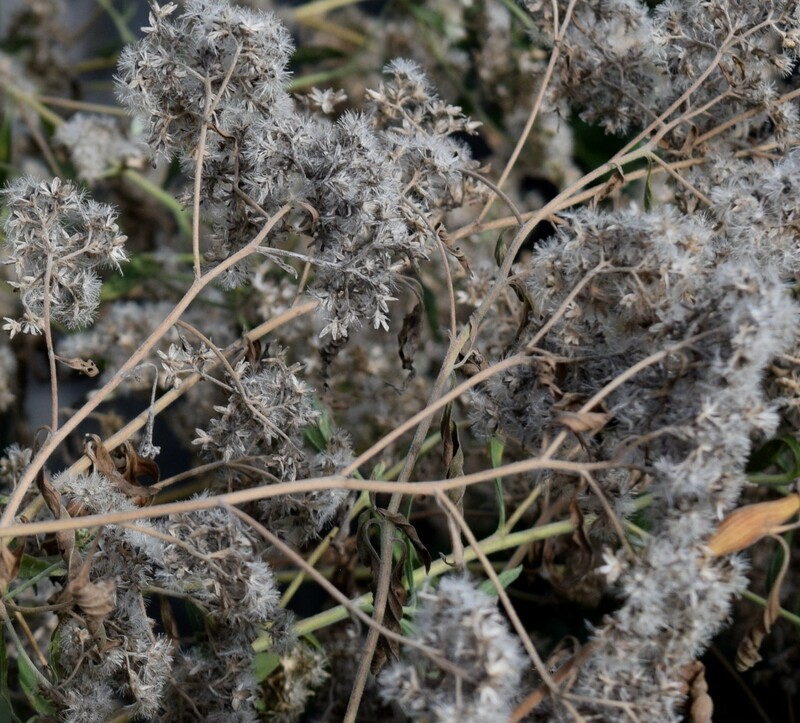 Dried flowers have seeds for birds to eat. Some seeds may be clinging to the flower head. Some fall to the ground. Evergreen bushes have cones with seeds. 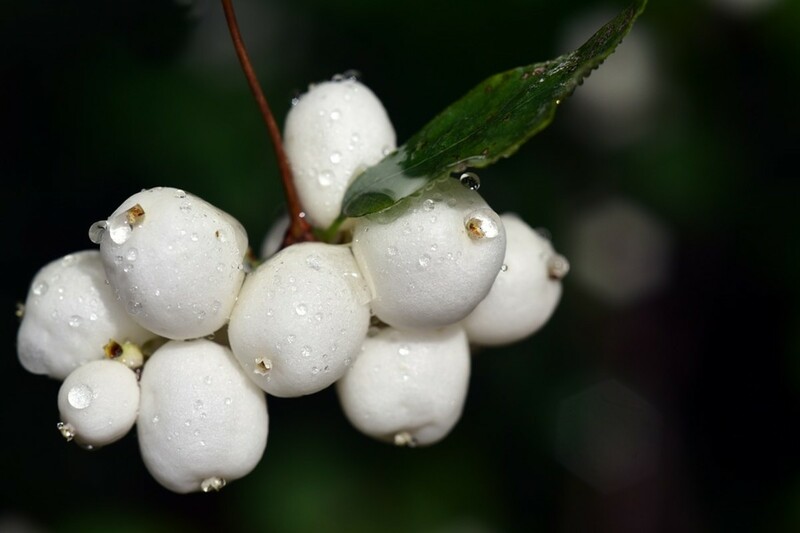 Decorative berries on bushes are favorites of birds like cardinals. Birds like fresh water that is not frozen. Give birds water to drink and clean their feathers. A bird bath with a heater designed just for it will keep the bird bath from freezing. For safety, remember to purchase only those made specifically for heating bird baths. Birds alert other birds about the location. 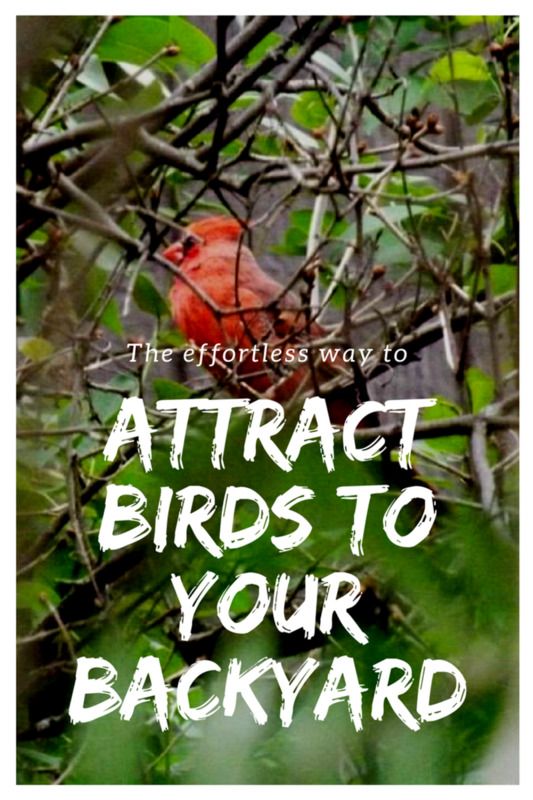 Don't worry if it takes a day or two or even a week for birds to come to your feeder. They will discover the food. Once you put seed out they will expect it every day. Joe Pye Weed - the decor with ready to eat seeds. Squirrels are the most likely uninvited visitors to feeders. Watch them demonstrate their acrobatic skills while snagging food. 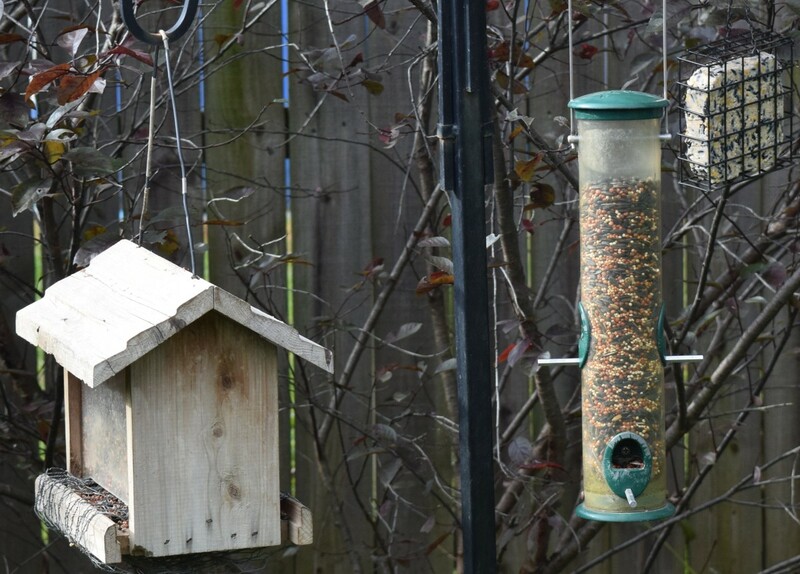 There are feeders that offer squirrel-proof features. These work somewhat. You really get to know squirrels' cleverness. Their wily ways can be entertaining even if they are eating the birds’ food. Solution: Put out special feeders for squirrels. Fill them with dried corn. 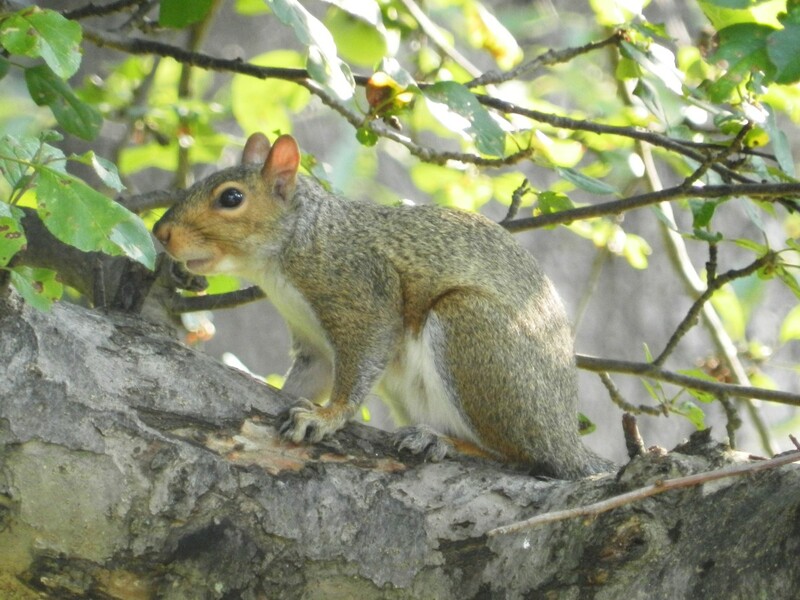 Place the squirrel feeder a good distance away from your bird feeders. This might distract them from bird seed. Some guests are predators.They prefer to eat the birds. During the daytime, hawks and cats are the main concern. They observe birds feeding. They wait to land on or pounce on unsuspecting birds. It’s part of the food cycle, just not very pretty. Solution: Place feeders out in the open. Plant some evergreen bushes nearby where birds can hide. This provides some protection. Late night snackers like raccoons, skunks and opossums may visit the feeders. Raccoons eat birds. However, birds know the safest places to sleep and are out of harm's way. While these three animals may devour the bird seed, they usually pose no threat to birds. Patience and being still is helpful while waiting for guests to arrive. Birds scatter at the slightest movement for safety reasons. See how long you can be still and count how many show up at one time. 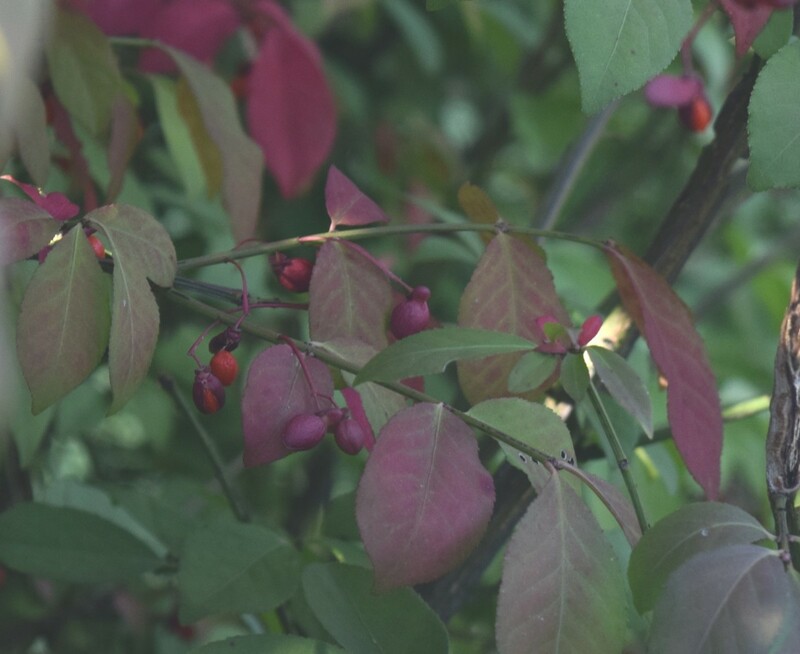 Burning Bush offers berries for birds. Each species is special. There are many species. Some estimates are nine to ten thousand species. Other estimates double that number to 18 thousand. Not all species live in the U.S. Birds you see all year are called permanent residents. Some birds are summer residents and move south in the fall. During the migration in spring and fall, you may see transients in your garden. It’s fun to figure out which bird species are visiting and which ones are permanent residents. Birds eat approximately one half their body’s weight in a day. Small birds eat more than that compared to large birds. Birds use their feathers to keep warm and may tuck their heads under their wings to sleep. Feathers shed water and also keep them warm. Simple pine cone feeder using peanut butter. Florist's paddle wire and wire cutters are on the right. Plate for the peanut butter so you can work from that and not the jar. You really don't want pinecone bits in your peanut butter jar! Wire for hanging – the fine green paddle wire that florists use is easy to find at craft stores. Cut a 24” piece of wire with the wire cutters. Wrap the wire around the top layer of the pine cone bringing the two ends together on one side. Tie them like a shoelace tightly as close to the inside of the cone as you can. 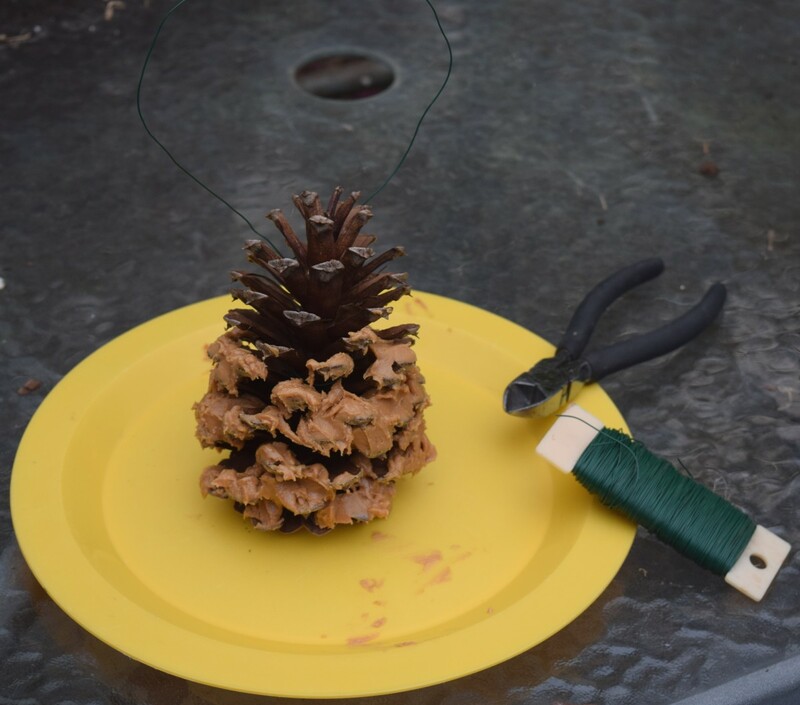 Bring both ends to the top of the pinecone to form a loop and twist them together. Use the spoon and scoop out about ½ cup peanut butter, placing it on plate. Smear peanut butter with the table knife all around the pinecone. Hang the pinecone feeder high on the outer edge of a tree branch or a leafless bush. Hanging it in a less sunny place will keep the peanut butter from getting spoiled. Warm weather melts peanut butter and suet. Birds shouldn’t eat spoiled food. Watch as smaller birds like chickadees, wrens, nuthatches and small woodpeckers to come to your feeder. 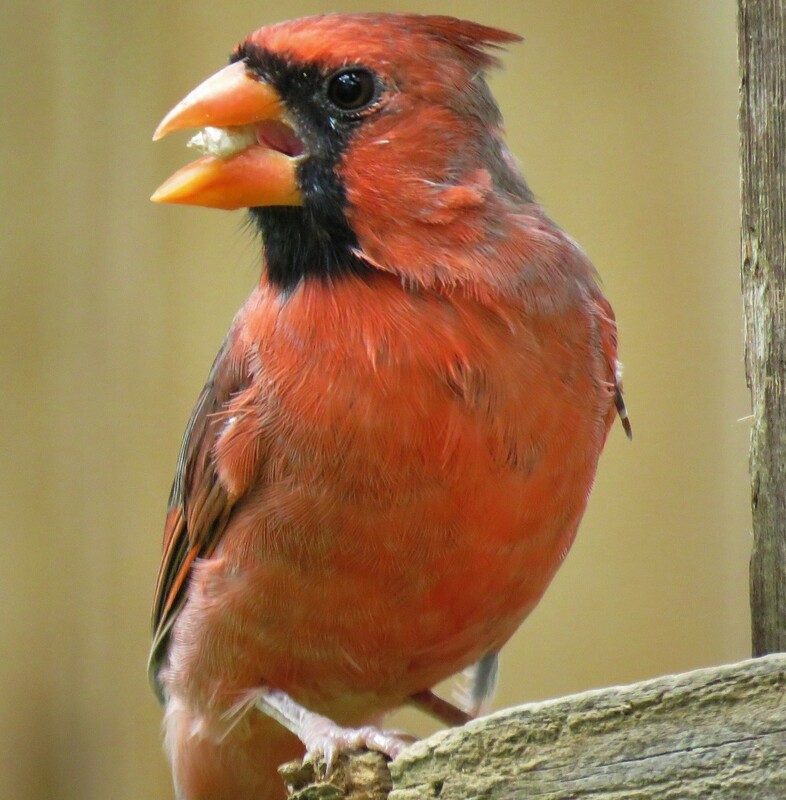 Birds are happy to have extra food throughout the cold and sometimes stormy winter weather. When the season changes to warmer temperatures the winter party is over. Some people like to keep the party going and feed the birds all year. 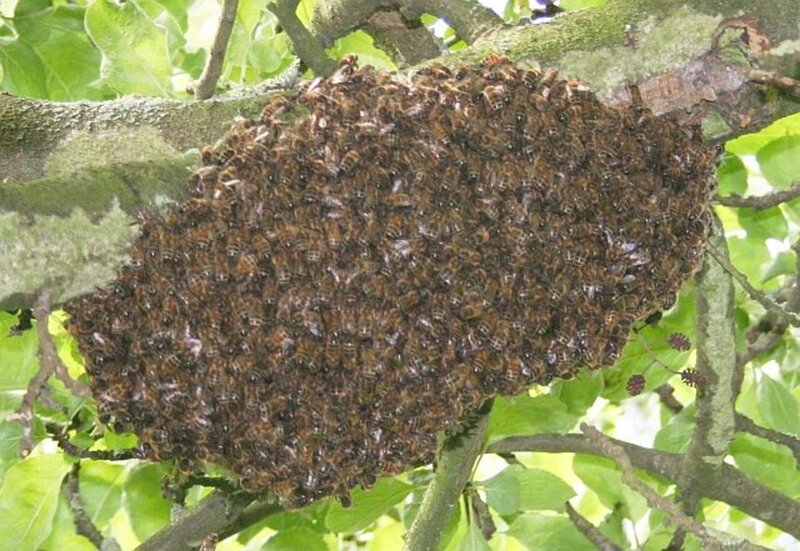 It isn't really necessary as birds have lots of insects to eat spring, summer and fall. If you decide you're hosting duties are done after winter, remember to clean the feeders before putting them away. They'll be ready for next year's winter party! 1. Hose spray works best to dislodge any clumps of seed. Concentrate the spray by setting the nozzle for a strong stream. 2. Dilute mild dish detergent with water in a bucket. 3. Swab mixture over the whole feeder with a clean rag or dip feeder in the bucket. 5. Let dry completely before filling to prevent clumping of fresh seeds.